Welcome to Mysore Lamps! It will be revived! and About Dr. Dave Irvine-Halliday, a Professor of Electrical Engineering , who used LEDs to light the first village in the world to help the poor in 2000 itself !! To confirm the online complaint lodged with the Yashvanthpur police station on 3/6/07 by identifying that it is the Chief Secretary who prevented the MD from discharging duties as a Government servant . My letter dated 2/6/07 addressed to Principal Secretary C&I Department. 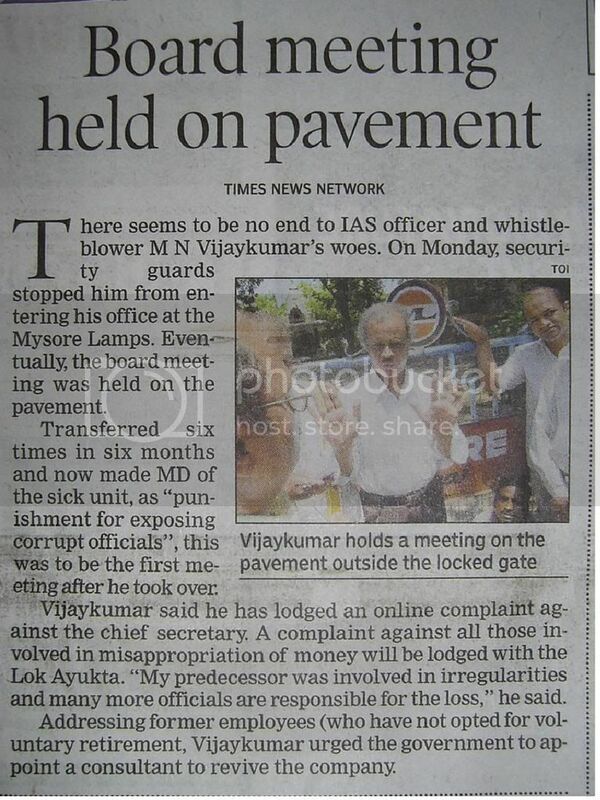 As after repeated requests to the C&I Department and the Chief Secretary no information was given about his work, facilities, Sri Vijayakumar was forced to resort to the use of RTI Act. As no information was given even when sought under the RTI Act he had to file an appeal with the State Information Commission and only after the Commission directed the C&I Department Subsequent to this a partial incorrect reply has been received stating that Sri Vijayakumar has no supporting staff, officers etc and that he has to make all arrangements himself as MD. In the absence of any supporting staff or facilities, Sri. Vijayakumar has decided to conduct the Board meeeting at his residence and to make available the agenda notes to not only the Board of Directors but to all citizens through this webiste. The proceedings of the Board meeting will be also put on this website. An email has been sent to the Principal Secretary, C & I Department informing him about this website so that all the Board of Directors can go through the agenda notes and fruitfully participate in the Board meeting to be held on 26/4/07 at 11.30 am at his residence. This method has to be resorted to as neither the C &I department nor the DPAR provided him any facility to function as a full time MD nor protection sought has been given. Eventhough Sri.Vijaykumar is a Principal Secretary Grade officer, he has not been provided with the facilities which even an Section Officer gets.As Sri Vijayakumar has repeatedly informed the Chief Secretary and the C&I Department that his posting as a full time MD has been done with ulterior motive and he has not been till today informed that he has been appointed with the specific objective of revival of the company, Sri Vijaykumar requests all concerned not too hope for anything. bUT in spite of all these, Sri Vijayakumar has informed the C&I department how to raise resources,if there is any intention to revive the closed company. But both the C&I Department and the Chief Secretary have not responded to this so far. Arrangements were made to webcast the Board Meeting on 26/4/07 itself but the meeting could not be held as no Board of Director turned up . 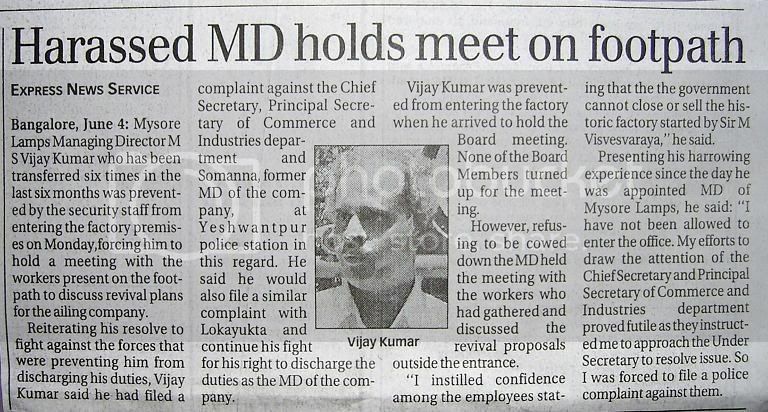 Again no director turned up on 30/4/7 for the Board Meeting even though the Principal secretary was asked to instruct the Directors to take it seriously . This gave scope to doubt if there are directors at all and hence Sri M.N.Vijayakumar held the Board Meeting alone and issued the proceedings!